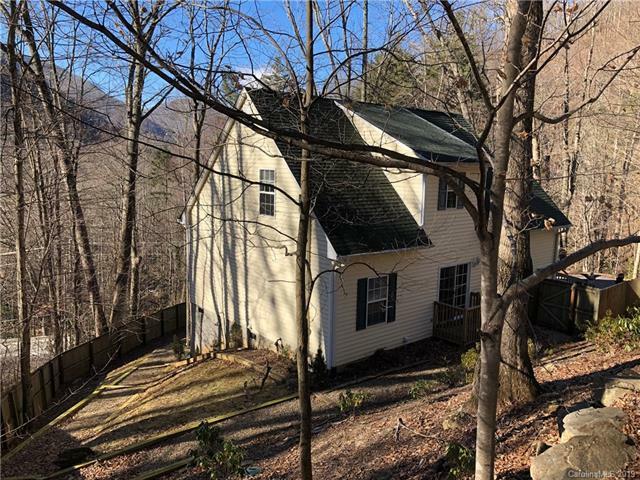 This quaint 3Br 2.5 Bth home on roughly 1.5 acres is minutes down the hill from Cataloochee Ski Resort in Maggie Valley - a Skier's Paradise! Come sit beside the fire pit on your stone patio nestled inside your fully fenced yard, sip some wine and soak in the view from your covered front porch, or cozy up next to the fireplace in the living room after a long day at work or on the slopes. One level living with kitchen, living, dining 1/2 bth, large Master Suite and laundry on the Main floor. Two spacious bedrooms with large closets and reading nooks share the 2nd full bathroom of the home. Recent improvemnest include: high end privacy fencing to enclose a portion of the acreage, with an electric gate to give cars access by remote control to the home, parking and gardens where your furry friends and little ones can safely play. Whole home security system and storm doors. Minutes away from Joey's Pancake House, Frankie's Italian Restuarant, & 15 min. to Ingles & Publix in Waynesville.